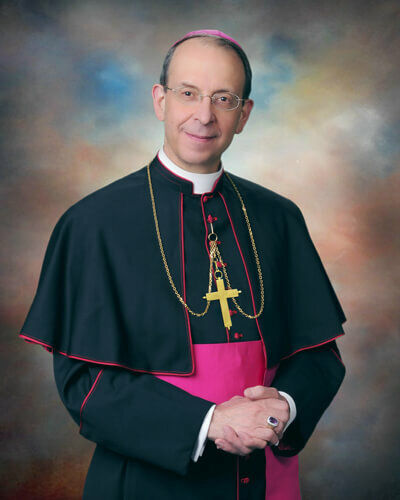 The pastoral letter, an open letter from a bishop to clergy and laity in his diocese, is Archbishop Lori’s second since becoming Archbishop of Baltimore in 2012. Haga clic aquí para versión de la carta pastoral en español. Last summer, a large delegation of leaders from the Archdiocese of Baltimore attended the National Black Catholic Congress1 in Orlando, Florida. They were part of an impressive gathering of black Catholic leadership seeking to strengthen evangelization in and through our nation’s African-American communities. 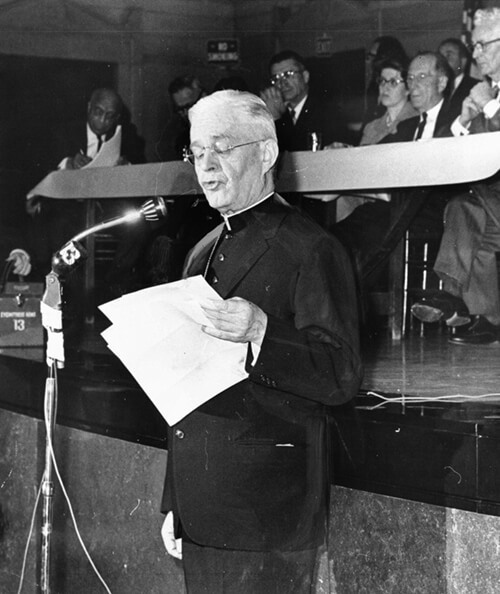 The Congress provided dioceses throughout the United States, including the Archdiocese of Baltimore, with a blueprint for ministering in and among black Catholic communities for years to come. I am happy to say that a number of young people from our Archdiocese were part of the Baltimore delegation to the Congress. Sister Gwynette Proctor, S.N.D., and Howard Roberts, representing our Office of Black Catholic Ministries for the Archdiocese, thoughtfully arranged a bus tour that brought the young people to historically pivotal places of the Civil Rights Movement. Among the stops was the Woolworth’s store in Greensboro, North Carolina, where, in 1960, a lunch counter sit-in took place that raised national sentiment against the evil of segregation. Their tour also brought them to Ebenezer Baptist Church in Atlanta where the Rev. Dr. Martin Luther King Jr. had been pastor. There these young people connected with Dr. King and his legacy: his preaching, his witness to truth and justice, and his Principles of Nonviolent Direct Action. It was an eye-opening experience for these young people to learn how Dr. King responded to injustice – not in anger or with violence – but with a peace and love that resists and overcomes injustice. 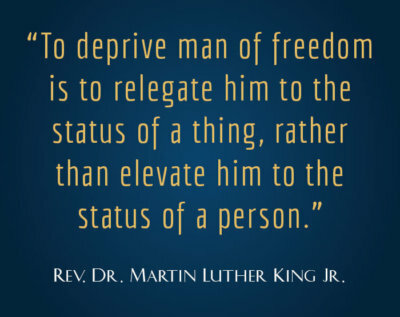 Now it is time for all of us to reconnect with Dr. King and his teaching. As I write these reflections, our nation is celebrating Rev. Dr. Martin Luther King Jr. Day. In many towns and cities, including Baltimore, there are prayer services, parades, demonstrations, prayer walks, lectures, days of service and discussions. In 2018, these gatherings take on special relevance for two reasons: first is the approach of the 50th anniversary of Dr. King’s assassination on April 4; and second is the sense, shared by many, that Dr. King’s wisdom is more necessary than ever in our violent and fragmented society. The wisdom of Dr. King’s teaching is both timely and important for our family of faith, the Archdiocese of Baltimore, and indeed for our whole society. We are planning to gather on April 12, 2018, with our interfaith and ecumenical brothers and sisters to mark the 50th anniversary of Dr. King’s death2. In preparation for that celebration and long afterward, however, we urgently need to retrieve, understand, embrace and put into practice his teaching and legacy. 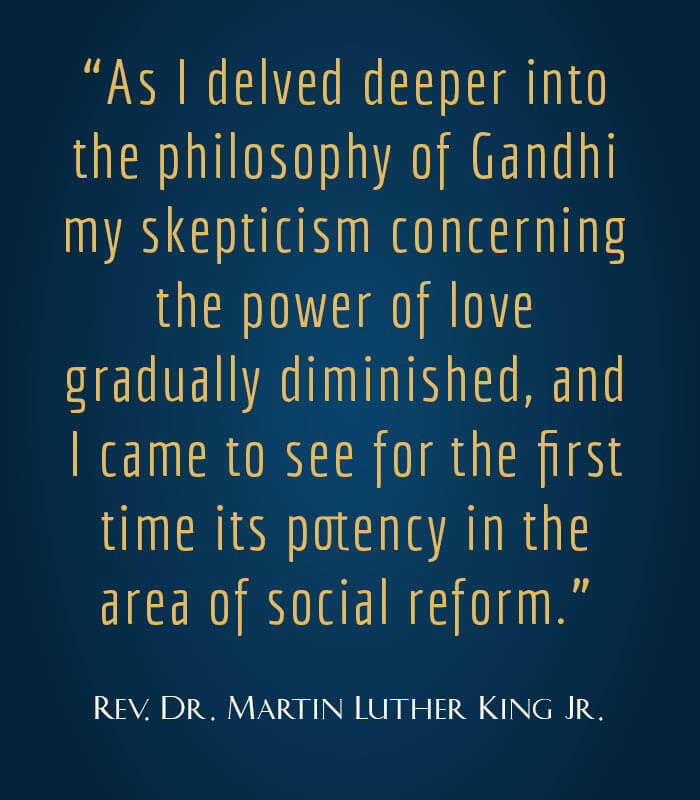 For, if in God’s grace we are to create the just, peaceful and compassionate society that Dr. King envisioned, we must undergo a lasting conversion of heart and mind and make a firm commitment to teach, learn and practice nonviolent direct action for social change. Good reasons for doing so are not hard for us to find. We grieve over the many people who lost their lives to gun violence in the City of Baltimore in the year just ended. 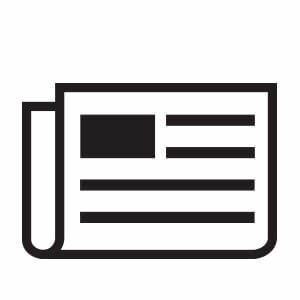 We are concerned about the urgent need to improve the relationship between law enforcement and the residents whom the police and city leaders are duty-bound to protect. Weighing heavily on our minds and hearts is the sin of racism that continues, sometimes overtly but often subtly, to insinuate itself in our relationships, institutions and communities of faith, including our own. Indeed, the sin of racism has tarnished the soul of our society for so long that racist attitudes can be deeply embedded in our subconscious, such that we may hardly know they are there. We must bring to light such attitudes and overcome them. Not to be ignored are conditions which create despair and spawn violence in our neighborhoods: lack of education, unemployment, a dearth of decent and affordable housing; a proliferation of illegal weapons; drug abuse and gangs; the disintegration of the family; homelessness; and so much more. These deep and systemic problems do violence to the dignity of real human beings created in the image and likeness of God. Even worse is the tendency on the parts of many who see continued decline as inevitable and who react to these harsh realities with indifference or jaded cynicism. In this stark environment, Dr. King’s principles of nonviolence are more necessary than ever: they are prophetic words of hope that can light the path forward. All of us need to walk this path of nonviolent hope. Indeed, we should not imagine that Dr. King’s principles apply only to troubled urban neighborhoods or solely to our African-American brothers and sisters. Violence, racism and a host of social problems exist in different forms and degrees throughout our suburban and rural areas as well. No family, no neighborhood, no community is immune from violent crime, domestic violence, drug abuse, racism and many other social problems that give rise to an angry and violent way of life. How often, for example, do immigrants face discrimination, hatred, denied opportunities and even unjust deportation? Think of how vitriolic and coarse public rhetoric has become in politics and the media, a coarseness that often spills over into private conversation. Instead of trying peacefully to reach the common ground of understanding, people far too often and far too quickly resort to abusive language. They may not kill their neighbors with bullets but they do “kill” them with words and gestures of disrespect. The commandment, “Thou shalt not kill,” pertains to all forms of violence against others, including the violence of economic inequality. 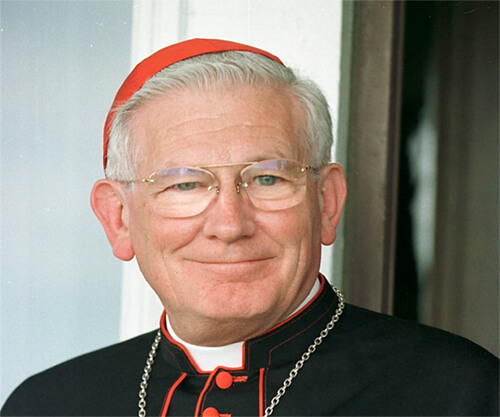 “Cardinal Shehan was booed twice last night by segregationalists who came to hear him testify before the City Council in favor of open occupancy legislation. Councilmen who sat through the crowded three-hour session in the War Memorial Building were visibly impressed with the Cardinal’s bearing – and shocked at the rudeness of a large section of the crowd…the Cardinal called on the City Council to give leadership to the counties by passing fair-housing legislation first. In these past weeks, many in Baltimore, including me, have spoken about “changing the negative narrative” about our city. Without denying or minimizing the tragic problems that beset our community, we need to abstain from a narrative of hopelessness that fails to see the good that is going on all around us. We need to acknowledge and actively support the efforts of many in the government, faith communities, education and non-profit communities to improve conditions, not to mention the heroic efforts and witness of many good people who live in our most underserved neighborhoods. When we fail to heed these voices and acknowledge their good work, we weave a story of despair, a self-fulfilling prophecy that only makes things worse. Hopelessness, as much as violence, destroys people and their communities. On the other hand, when we acknowledge one another’s efforts and try to maximize and coordinate them, then we are building enthusiasm, momentum and goodwill – all necessary ingredients for achieving a better day. Dr. King’s principles of nonviolence help guide us toward changing the narrative from fear to courage; from enmity to friendship; from injustice to human dignity; from hate to love. Let us be clear: Dr. King’s principles are meant to change us and in changing us to change our society. They are addressed first and foremost to the heart, calling us to conversion, a conversion that leads to a different way of thinking, speaking and acting. They urge us to leave behind “business as usual” and instead to find ways not only to come together but to stay together for the long haul, in peaceful dialogue and cooperation for the sake of each person’s dignity and for the common good. 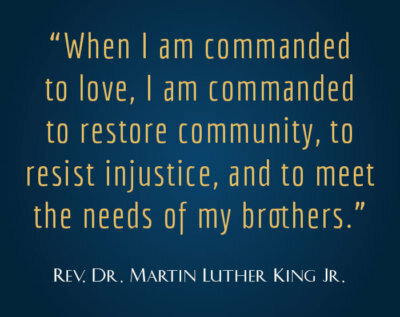 Thus, if we truly allow Dr. King’s principles of nonviolence to guide us to conversion, we will not be content to camouflage our problems but rather be spurred into action; we will be moved to address and resist injustice in our community. Ultimately, however, it is only a change of mind and heart on the part of many that will lead to a new beginning for us and our beloved community. Archbishop William D. Borders, who served as spiritual shepherd of the Archdiocese of Baltimore from 1974 to 1989, was known as a gentle man who had stood up for racial justice as a first-time pastor in the deep south where he desegregated his parish by burning the ropes used to separate black parishioners from whites. He arrived to Baltimore just as public schools were being desegregated. He went on television to appeal for peaceful cooperation. 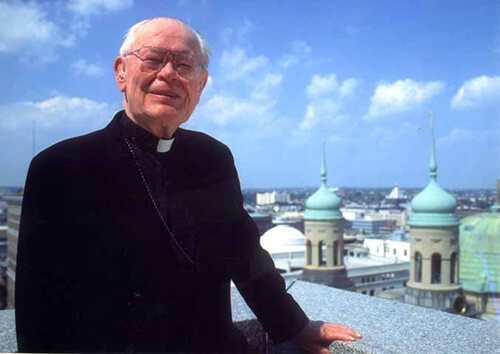 “It worked,” he recalled at the time of his retirement, noting others made similar appeals for calm… “but I was the only one who went public.” Under his leadership the Archdiocese adopted its first affirmative action hiring plan and Baltimore was the first diocese in the nation to protest apartheid by divesting holdings in companies doing business in South Africa. 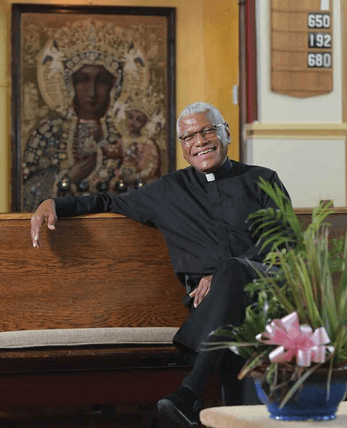 The Archbishop also nominated Father John Ricard, S.S.J., to become Baltimore’s first black bishop. In seeking to make Dr. King’s principles our own, we need to remember that they were the product not merely of his own study3 and reflection but also of his lived experience and that of his people. They came to birth in a society saturated with racism and injustice. They were born in the hearts of people of dignity and greatness, yearning to be free; yearning to lead peaceful, productive and generous lives; yearning to be the persons God created them to be. These principles took shape as Dr. King held up the experience of his people to the light of the Gospel and the Christian Tradition. Thus, they constitute not an abstract philosophy, but an applied theology of liberation. All across this Archdiocese, those same yearnings well up in many hearts, especially in the wake of the unrest that rocked the City of Baltimore in 2015 following the death of Freddie Gray Jr. In setting forth Dr. King’s principles of nonviolence, it is to your heart that I appeal – to your desire for justice, love and peace. And so I invite you to reflect with me on these principles and then to make them a springboard for further prayer, study, reflection and discussion in your families, parish communities, prayer groups, and in other gatherings throughout the City of Baltimore and nine counties that comprise the Archdiocese. I would also welcome your observations on various ways these principles might be lived and applied as we seek to create a civilization of peace, justice and love. This page has been created on the archdiocesan website so that such conversation and further study can occur. I pray it will be useful in advancing the healthy exchange of ideas that is essential to creating an atmosphere where the conversion of hearts and minds can be achieved and injustice can be addressed more vigorously. 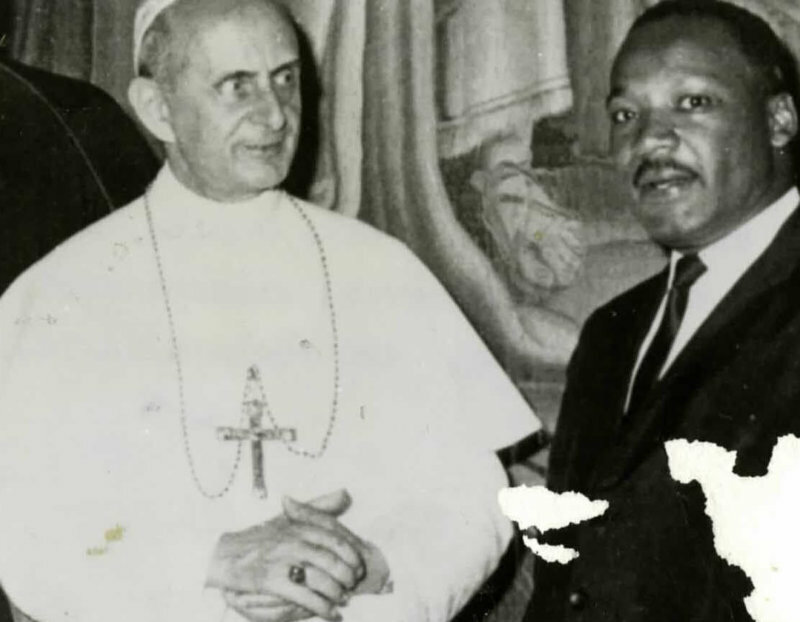 Many years ago, St. John Paul II said, “The contemporary world … needs the witness of unarmed prophets who are often the objects of ridicule.” Dr. King was himself one of these “unarmed prophets” who taught us to resist evil actively without resorting to violence of any sort. Embracing his teaching requires of us courage, that is, a deep spiritual strength. Courage summons our spiritual, mental and emotional resources so that we can speak and do the truth in love (cf. Eph 4:15). Renouncing physical, verbal and emotional violence, as Jesus did when the temple guard struck him (Jn 18:22), the nonviolent person instead bears witness to the truth by living it and seeks not to coerce others into conformity but rather to persuade them in love. Living and acting in this way can be risky. We derive the courage to overcome the skepticism and cynicism of the world around us through friendship with Jesus in the power of the Holy Spirit. Thus for us to live this principle as followers of Christ, we must rely on the strength of the Holy Spirit, whose gift of courage we received in the Sacraments of Baptism and Confirmation. Such courage prompts us to resist injustice by persuasion, negotiation, personal witness, use of the media and, when necessary, peaceful protest. How does violence mask cowardice? What forms of violence persist in my heart and in my behavior? How do these contribute to the violence so prevalent in our community? A key principle of Catholic social teaching is “solidarity,” which, as St. John Paul II said, must include “a firm and persevering determination to commit oneself to the common good.”4 Solidarity requires us to recognize that, as brothers and sisters, we are equal because we share a common humanity. More profoundly, it means recognizing God in every person and every person in God. To cite the motto of Catholic Charities of Baltimore, it means “Cherishing the Divine” within each person. Our common humanity, sharing the spark of divinity, is the basis for a friendship that crosses lines of race, ethnicity, politics and culture. By renouncing all forms of violent and belligerent behavior, we seek to open doors of friendship, to build relationships across the lines that divide us, to touch the hearts even of those who believe that violence is the only response to injury. As Dr. King has written, “Nonviolence does not seek to defeat or humiliate the opponent, but to win his friendship and understanding.” And it is friendship that often paves the way for a meeting of minds and hearts in dialogue and mutual understanding and leads to authentic human development. We need to cultivate civic and political relationships aimed at human dignity and the common good. We need to foster friendship in our families and local communities. And, as Pope Francis exemplifies, we need to be friends with those living on the peripheries of our society – people who are homeless, unemployed, variously handicapped, newly arrived – to name a few. They are not statistics, but people. How do my grudges and resentments contribute to the anger of our culture? Do I seek to build bridges of understanding among those with whom I disagree? Are my friendships limited to those whose backgrounds are similar to mine? Do I share in the extreme partisanship characteristic of the times? Do I participate or take pleasure in the culture of ridicule and entrapment? Am I engaged in the political process, and what values do I bring to it? 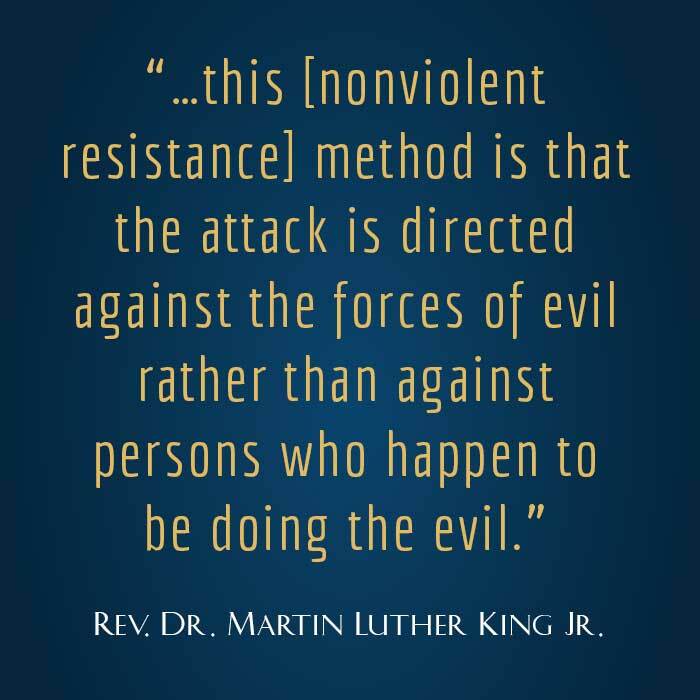 Nonviolence is not a mask for indifference. Still less is it a mask for shirking responsibility for one’s convictions. In 1966, my predecessor, Lawrence Cardinal Shehan – a gentle, peaceful man if ever there were one – courageously championed nondiscriminatory housing policies at an open Baltimore City Council meeting. He was met with ridicule and disrespect; he even received death threats. Yet his calm demeanor and forgiving spirit were persuasive to many, and in the end, helped to open many minds and hearts that had been blinded by prejudice. Nonviolence does not allow one to proclaim peace but then retaliate in hatred when one’s efforts meet with resistance or ridicule – something Pope Francis describes as “polite persecution.” It means accepting suffering – even violence – without retaliation as a means of interior purification. From a pure and peaceful heart flows a witness to truth and love that can often cut through the toxic haze of racism and injustice where reasoned discourse might otherwise fail. How often the early Christian martyrs opened to the faith the minds and hearts even of their persecutors because of their courage and love in the face of suffering. In a culture that often rejects suffering as meaningless, Dr. King, both by word and example, teaches us to recover its power to educate and transform minds and hearts. In what ways am I called to bear witness to the truth? How do I respond when my witness to truth is rejected or ridiculed? How do I overcome the urge to retaliate? In this principle, Dr. King takes us to the heart of Jesus’ teaching: “You have heard it said, ‘Love your neighbor and hate your enemy.’ But I tell you, love your enemies and pray for those who persecute you” (Mt 5:43). As Dr. King himself said, “At the center of nonviolence stands the principle of love.” It is a radical form of love that refuses to engage in any form of violence – physical, verbal or emotional. Indeed, it is a form of love possible only because God has loved us first and cares for us with a love that is at once infinite, tender and merciful. It corresponds to Jesus’ command elsewhere in the Gospels: “Love one another as I have loved you” (Jn 13:34). It is a form of love that perseveres, even when met by hostility. 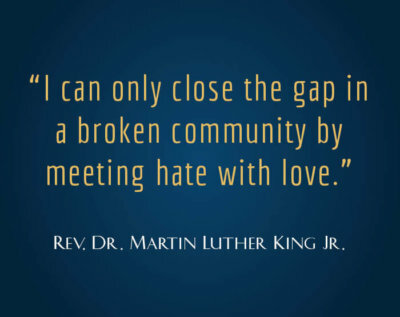 Again, to quote Dr. King, “The best way to assure oneself that love is disinterested is to have love for the enemy-neighbor from whom you can expect no good in return, but only hostility and persecution.” In this way, Dr. King calls us to an active and persistent love that does not give into discouragement in the face of intractable problems and seeming despair. Self-giving love seeks no benefit for itself but rather seeks the good of the other, while at the same time seeking to build, not only personal relationships, but also communities, together with a sense of teamwork and collaboration for the common good. The love that springs from our relationship with Jesus Christ does not coexist with evil but seeks to overcome evil with goodness, violence and hatred with love. As Scripture attests: “Whoever does not love a brother whom he has seen cannot love God whom he has not seen” (1 Jn 4:20). In the same way, St. Paul urges us to “get rid of all bitterness, all passion and anger, harsh words, slander and malice of every kind.” In place of these, he teaches, “be kind to one another, compassionate and mutually forgiving, just as God has forgiven you in Christ (Eph 4:30-32). At the root of this form of love is the recognition that God loves each person tenderly, that God is rich in mercy, and that all human life is sacred. As a result, for all our differences, we are truly interrelated and called to extend to others the same tender love and mercy God has first shown us. Let me add that this form of love is best learned in the family, which is meant to be a kind of “school” of self-giving love. We cannot create a loving society unless it is made up of families where love and reconciliation are lived and exemplified. Can I think of instances where good has overcome evil? 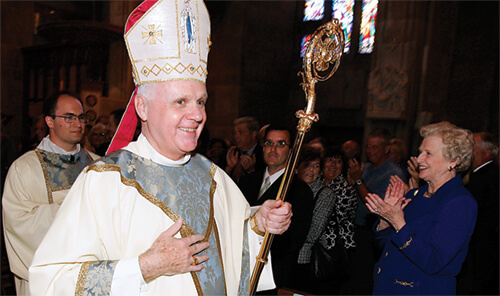 What can be done to strengthen family life in our parishes and neighborhoods? Pope Benedict XVI famously said “One who has hope lives differently.” This is more than a summons to an upright personal morality; it is summons to a life of self-giving love that seeks the good of others, especially those most vulnerable. Similarly, hope is more than mere optimism about the future. Hope is born of love, of God’s love for us, a love that convinces us that injustice, violence and death are not the last word about our lives, a love that empowers us to advance goodness and justice even in the direst of situations. It does not wane even when all seems lost. It does not give up on God and does not give up on other people and their communities. Accordingly, hope is not merely a sentiment; it unfolds in action. It prompts us repeatedly to work for a more humane world, to struggle against needless suffering and injustice, even if we cannot eliminate them. Hope prompts us to embrace those who suffer injustice, deprivation and illness, pointing always toward the God who is just and loving. Indeed, we live in hope for the day when, in the resurrection of the dead and the last judgment, God will indeed undo past suffering and injustice and set all aright. Far from making us complacent, this hope should instill in us a sense of responsibility to undo violence and injustice, here and now, in the present, in our lifetimes. As the Second Vatican Council declared, “The future of humanity lies in the hands of those who are strong enough to provide coming generations with reasons for living and hoping” (Gaudium et Spes, 31). What is the difference between hope and optimism? Do we believe that God’s justice and love will ultimately triumph? How can we be prophets and ministers of God’s love and justice in the actual situation of our lives? 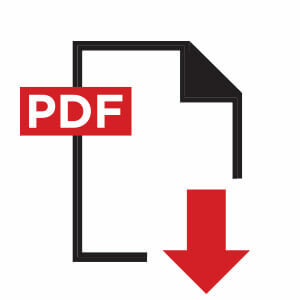 Click the image above to read a special report on the fight against racism in the Archdiocese of Baltimore. 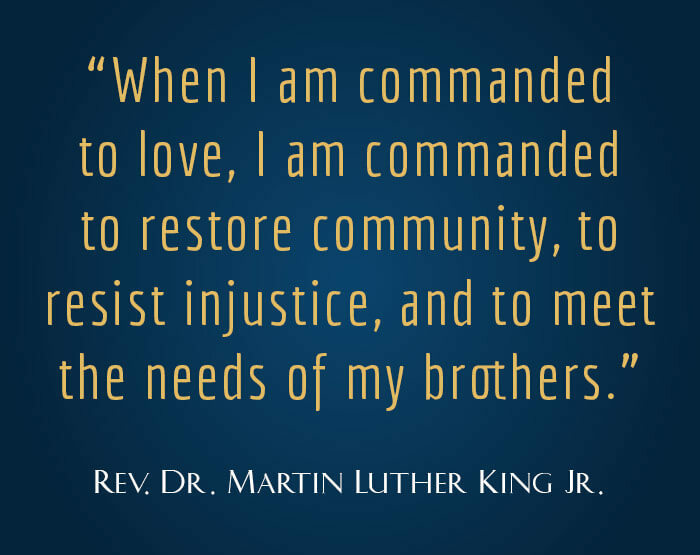 Dr. Martin Luther King Jr’s principles of nonviolence call for a change of heart. However, they also call for action. 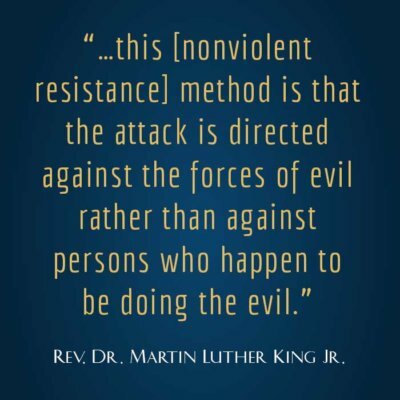 Nonviolence is active in its resistance to injustice, not passive; vocal, not silent. Citing the prophet Amos (5:24), Dr. King cried out, “Let justice surge like water and goodness like an unfailing stream.” Thus, Dr. King also spelled out the steps we need to take in order to live nonviolently. As part of discussion and reflection, let us review these steps that we ought to embrace and live and put into practice Dr. King’s prophetic teaching. Once again, your comments on practical ways to implement these steps are most welcome. You may share them here. Often, we think we may know about our own and surrounding communities. A second look may show, however, that we (myself included) have a lot to learn. 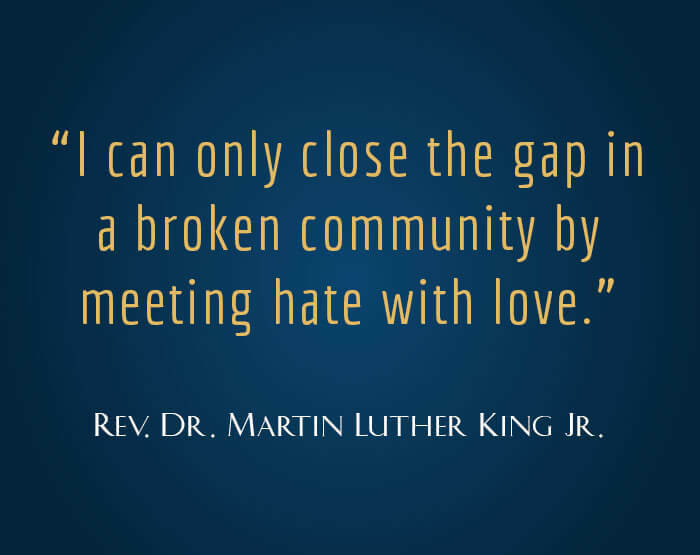 For that reason, Dr. King urged his followers – and now he urges us – to learn all we can about both the challenges as well as the opportunities in our diverse communities. In doing so, we will better understand the nature of the problems to be faced and also the goodness and humanity of people who don’t live so far away from us after all. As we come to understand both the problems and opportunities in our various communities, we need to share that information with others. Often this is done informally with family members, relatives, friends and co-workers. We can build a better society neighbor-to-neighbor. Relatives, friends and neighbors can join in advocacy and service for the good of others. We should also share our experiences with those who represent us in government in hopes of promoting the common good together. Enthusiasm is a good thing, but it is not enough. So often people get a yen to change the world, but that yen lasts about as long as their New Year’s resolutions to go to the gym or to go on a diet. Addressing long-standing and systemic problems requires a commitment born of prayer and mutual support. It requires we hold one another accountable as we work together peacefully for authentic justice and peace. Disputes and disagreements are part of life. Unfortunately, people skilled in the art of negotiating can be in short supply. We will not all be equally good at this, but we should try to be among those who help to find common ground peacefully, with integrity and in full fidelity to the teaching of the Gospel. 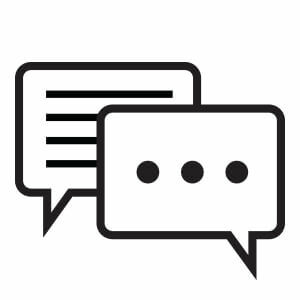 In troubled communities, it is important to talk to both those who are wounded by societal ills and those who contribute to the breakdown of society. This is not always easy to do. It requires prior preparation, reflection, humility and a sense of humor. It would be nice to live in a world where all negotiations conclude successfully. Experience teaches us that this does not always happen. What is next? Sometimes there is need to draw wider attention to a problem. We are blessed to live in a free society where we can peacefully and publicly express our views, whether in traditional or social media, in letter-writing campaigns, in meetings with elected officials or in public demonstrations. The key word, however, is “peacefully.” Peace is more than the absence of violence. It requires of us more than sloganeering. Rather, our public statements in whatever form they take must be reasoned, constructive and civil. As we enter into negotiations and speak publicly about issues of importance, our goal must be to build bridges and, where possible, to bring about reconciliation between opposing parties. It is important that we seek not only to reconcile but also to begin to network the good efforts going on in all our communities to create a more humane society. Reconciliation entails, not merely the cessation of a dispute, but renewed willingness to work together for the good of our society. It means that we should not be competing with one another in serving our communities but rather cooperating, networking and pooling our wisdom and resources for the good of others. No one person or group should claim to be “the only one” concerned about the problems all about us. Such an attitude divides rather than unites. Safe Streets is an evidence-based violence prevention and interruption program that works to reduce shootings and homicides in high-violence areas. Operated by Catholic Charities of Baltimore in collaboration with the Baltimore City Department of Health, the program is based on the premise that violence is a disease that can be prevented using disease-control methods. Brittan Grahman, 26, who has been helped by Safe Streets, shares her story. Being a resident of the Sandtown community for the majority of my life, I’ve witnessed everything from poverty, major drug abuse, drug dealing and crime at unimaginably high levels. I also have encountered positive people and programs that have given the community help and hope despite the circumstances. However, after I made a wellness check on a neighbor who misunderstood my concern for malice, my family and I began to receive threats. Though I was afraid for my husband and children, I first sprang into protection mode. I embraced the violence I faced with rage. My husband immediately saw the bigger picture and asked me to calm down. Now the problem has been resolved thanks to Ms. Nicole and Mr. Lamont. My family and I once again feel safe in our home and when we walk out our door. Thank you Safe Streets for helping us feel safe again. I also want to thank Safe Streets for helping me find resources to furnish my apartment, for the food they gave us on Thanksgiving, and for coats, gloves and hats. Safe Streets has been a positive impact on my family. Thank you Safe Streets for everything! Since coming to the Archdiocese of Baltimore nearly six years ago, I have had the privilege of working with teachers, including religious women and men, who dedicate themselves to their work in Catholic urban schools; priests and religious who live and minister in some of the region’s most desolate neighborhoods; and lay women and men in Catholic Charities and other social service organizations who serve the poor and vulnerable with a skill and dedication born of faith. Along the way, I have met many volunteers in parishes and in organizations such as the Knights of St. Peter Claver, the Knights of St. John, the Knights of Columbus, the Knights of the Holy Sepulcher and the Order of Malta who regularly leave their comfort zone to serve those in need. I have also had the privilege of dialoging and interacting with diverse religious leaders and went with a group of them to Rome to meet Pope Francis. Out of these meetings, friendships and avenues of cooperation have developed; they have helped sharpen our common focus on addressing racism and racial inequality. In addition, I often find myself meeting frequently with local and state elected officials. Most often those discussions pertain not to the internal needs of the Archdiocese, but rather to the needs of our most vulnerable citizens and the common good of the wider community of which we are a part. 1) Continue efforts to network our services, especially in the City of Baltimore. By linking the excellent work of Catholic Charities, St. Vincent de Paul, our healthcare institutions, schools, universities, parishes and other ministries, we can strengthen our witness to human dignity while serving those in need more effectively. Such efforts also help to change the negative narrative about Baltimore into a hopeful narrative. 2) Continue forming cooperative relationships among parishes. When urban, suburban and rural parishes form cooperative and friendly relationships, many barriers are broken down. These relationships involve more than economic support. They are ways for diverse parish communities to come together, to know and love one another, and to work and worship together. 3) Personal involvement is necessary. When we leave our comfort zone to go to the so-called peripheries, we make a discovery. People who live on the peripheries are not peripheral; they are real human beings, each with a story, and our encounters with them often bring rich and unimagined gifts to our lives. By involvement in ministries such as Our Daily Bread, our community schools, our prayer walks through areas we may seldom visit and much more, all of us can come to know, love and respect those whose lives might be very different from our own. What is important is not only the bread that is served or the education that is imparted; it is the mutual love and respect that are communicated in the process. 4) Ecumenical and interfaith partnerships allow us to achieve far more together than if we work separately toward change. Building stronger and deeper relationships with women and men of different churches and faith communities who also teach and practice Dr. King’s principles of nonviolent direct action will give us a greater chance of succeeding in advancing our goal of achieving a more just and tolerant society. Finally, let us not see any of this as a distraction from our efforts to re-evangelize our parish communities and the entire Archdiocese as such.5 On the contrary, faith, worship and service are inextricably linked in the divine logic of the Gospel. A church unengaged in serving the poor and striving to create a more just and humane society does not bear authentic witness to Christ and to the Gospel of the Beatitudes. For so many reasons, we do well to heed the prophetic teaching of the Rev. 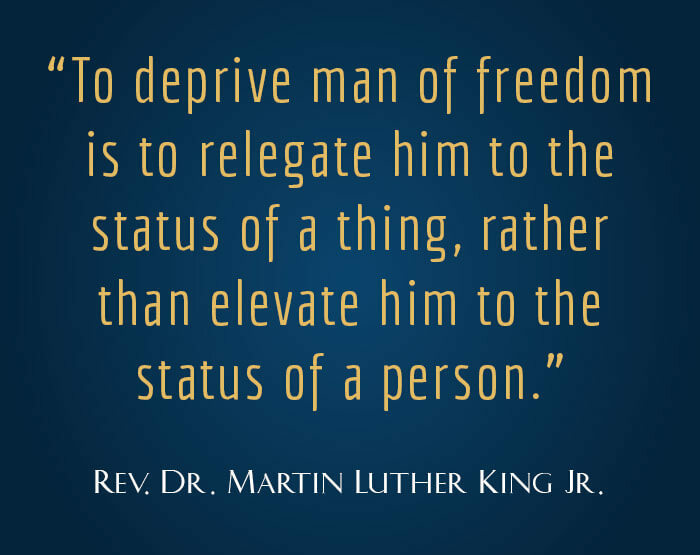 Dr. Martin Luther King Jr. and to put it into practice. Guided by his principles, we will take a further step in being “a light brightly visible,” a Church that brilliantly reflects the light of Christ. 4St. John Paul II, Sollicitudo Rei Socialis, 1987, no. 38. The photos that appear on this page are courtesy Catholic Review, Catholic News Service and the Baltimore Sun. Read full captions on page 32 of the pastoral letter here.